The countdown for our wedding continues, and I have one more project checked off my list! I’ve been working on them slowly for a couple of months, but I was forced to finish them up this afternoon when the boy told me he was getting sick of the pile of pillows in our living room! DIY Pillows for my wedding! Our venue is outside in a courtyard in Southern California, and one corner has a long white stucco bench down the side. 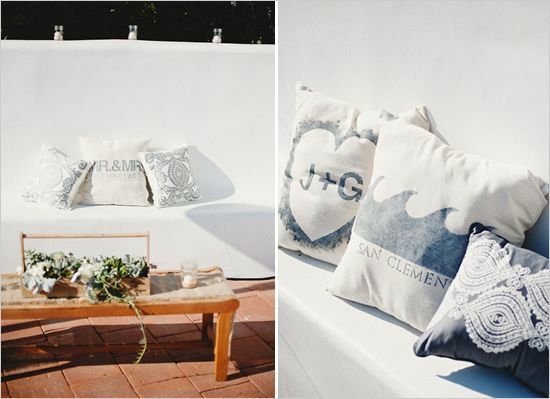 When we were looking at other wedding pictures from the same place, we noticed a couple couples got creative and had personalized pillows sitting on the bench. It added a great personalized feel to the place and added some much needed color. So, with a little inspiration from past weddings– I got to work! I bought Craft Smart Acrylic Paint at Michaels ($.49 check out their weekly coupons, they always have a 40 – 50% off one item) and all sorts of extra paintbrushes and sponges to help me get creative. We also bought a pile of stencils, but in the end learned that buying Freezer Paper ($5.50) was the best way to get shapes that didn’t bleed paint around the edges. Stenciling sounded like a good idea, but the biggest problem was that we were painting directly onto the pillows, so they were lumpy and convex. If we were painting on flat pillow cases, stencils would have been perfect. Unfortunately, since we were using the $1.99 ikea pillows, they don’t have an outer pillow case that we could take out and flatten- thus the problem. Freezer paper was something I didn’t even know existed- but it worked well. I made simple shapes and adhered them to the pillow by first heating up the pillow by ironing it (also made it smooth for better painting) and then ironed the pre cut shape wax side-down onto the warm pillow. (Do NOT use the steam option or any water on the pillow- once the freezer paper is on and you’re painting, the paint will bleed all over if you paint over the wet spot). I quickly got sick of the individual letters and just started making big shapes, like hearts and waves. All the mix-up pillows got painted over Jackson Pollock-style, but I think they add a good pop of pillows. 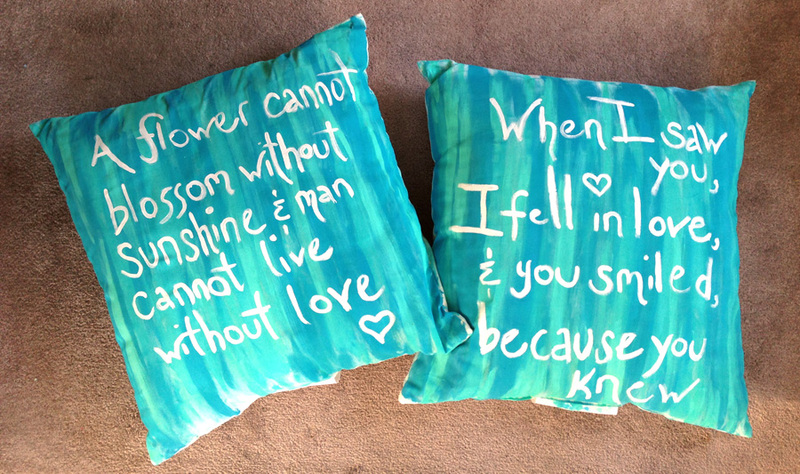 In the end I ditched any help whatsoever and globbed paint onto the pillows and just started painting phrases I like…. I’m still not sure if those two will make the cut in the end. 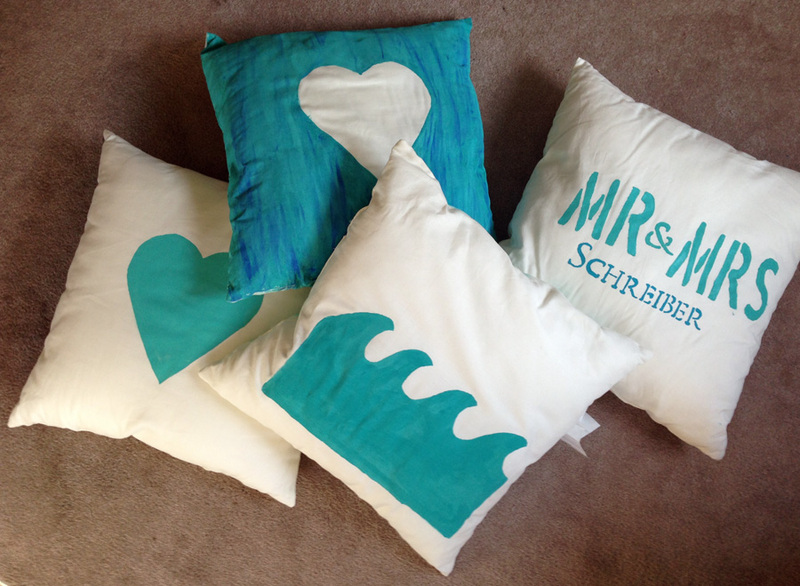 There you go- DIY wedding pillows! Total cost for 12 pillows ~$50.